Lulupu Challenge#52 - BABY - A little bit of Heaven! 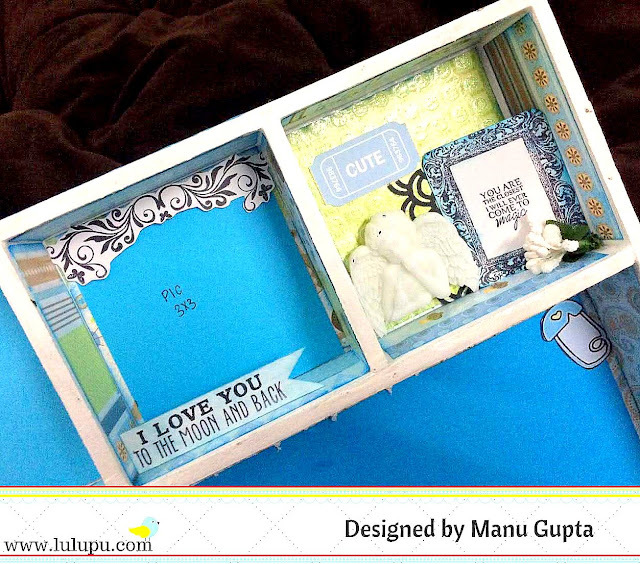 Do check out the post and link your entries to win an awesome goodie bag from Lulupu. For this post, we have a CASE sketch from Tanvi, which I have interpreted in the canvas layout. Here's a close up look of the die cut sentiments and the patterned paper with the lace. I hope you liked my project. Baby - A Little Bit of Heaven !! Another good news is!! Lulupu Store will be back with a bang in September. In addition, Lulupu is accepting pre-orders!! And this gives you enough time to get all your crafty wish list on your hands!! Do remember that the pre-order closes on 30th August and you would need to send an e-mail to hello@lulupu.com before August end to get the pre-order completed! It's all about the Babies theme this month, but as we did a little change in the posting model, The second Forthnight is all about one theme that the DT's will be interpreting and giving out reviews, tips, techniques on that particular topic. The topic for this fortnight is CASE the Sketch, and we have an awesome and very simple sketch by our DT member Tanvi! The sketch can be interpreted in a lot of ways and can be played around with various techniques ! I have made two very simple and minimalistic cards done with this sketch. In my interpretation of the sketch, I have replaced the circle with a square and worked around on that base for my cards!!! The flowers are stamped from a Micia stamp and then colored using watercolor pencils! A simple Sentiment completes my card! I so love this one!!! That Orange background color pops up the complete look of the card!! I hope you liked my interpretation and would get inspired by the awesome and fab work done by the DT members!!! Do remember to enter into this months challenge here. Good morning & a very happy Monday to all! First of all i really want to Thank you for giving me this opportunity to design and show some of my creativity through your blog. I hope you will really enjoy and like my tutorial. So lets get start. I am from an Ahmedabad city, graduate with Computer Application Degree. Was a working woman but now a successful housewife. I am blessed with a very supportive family and in-laws too. Wife to a Aircraft Maintenance Engineer and we have one cute little daughter, she one and half year old and let me tell you she is so much curious to do work with me when i experiment with my tools, and finally she mess all my craft area. As you know every child is in someway an artist but i got this gift from my dad as he is a painter and now he is a Studio Designer. So i used to do sketches, painting. I was also rewarded in intermediate level painting. And then now after marriage we have shifted to other city and i found much time to involve in my hobbies again so i started making cards for my husband and he encouraged me a lot so i slowly learnt much more by practicing varieties of cards to bring my own emotions of love, affection and best of my thoughts in cards. About blogging, i started when many of my family members liked and then i went online to see how much my creation get response and i was amazed with it. People loved it and encouraged me for more craft ideas and techniques. Oh its a long list but most of them are My trim and score board, Envelope board, pair of scissors, and of course my favorite pen and pencil. Quilling is my first start towards crafting but once you start and experiment with watercolors, inks, embossing paste and powder etc...then you just cant stop yourself for more and more of these. 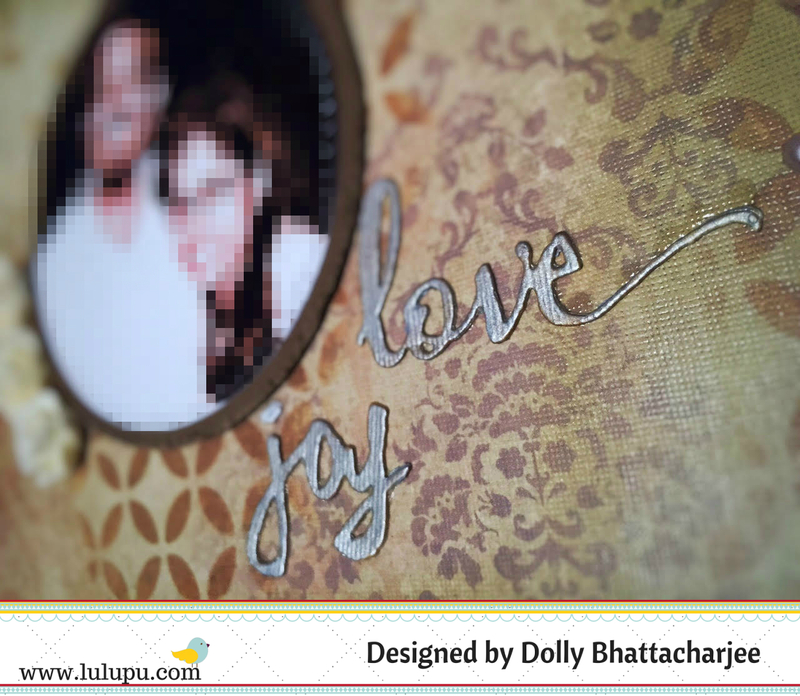 My crafting style is i want my project to be simple with detailed and perfect work. There has always been some short of crafting i have been doing so cant say exactly. Different style of cards where you can put your emotions and feelings together. I have a long list but first two are my dad and a loving husband. I follow lot of artist few are Jennifer McGuire, chari moss, Brandy cox and many more. and husband. When not crafting i am fully dedicated to my daughter. I am currently working on twist of watercolor and embossing techniques. Lets get start with the tutorial i have made for you guys. Hope you enjoy. At first glance you might think this is a simple card. Well that’s the plan so that once its opened you get a surprise when it folds out. You get some idea of the exploding part from the above picture. This is almost fully opened. Its a one layer wonder inside so that it fold easily. Another view. It really is very simple to make. 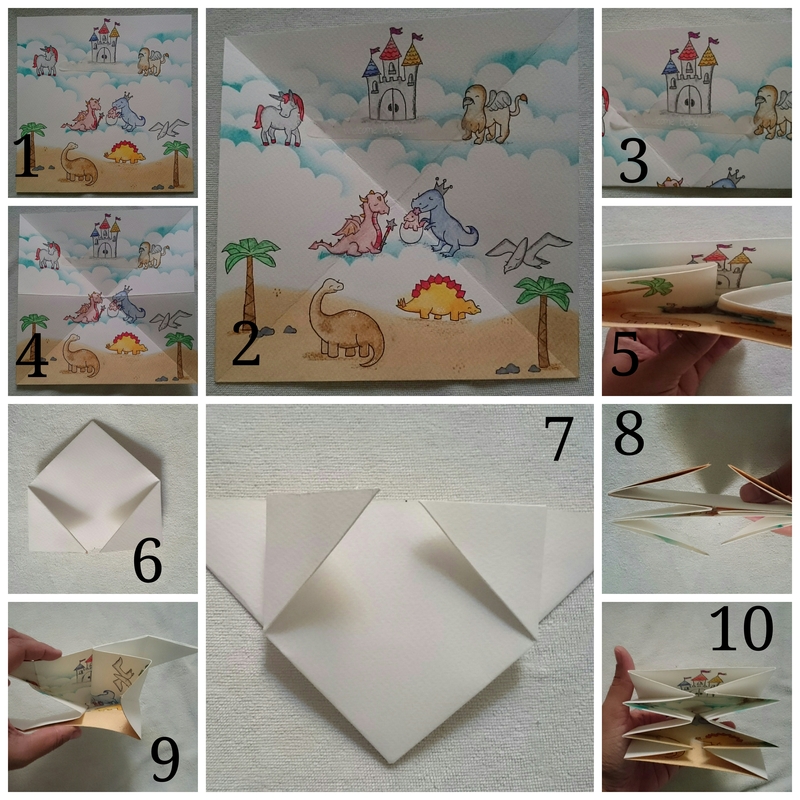 The actual folding part is very quick to do and how long you spend making it would depend completely on how detailed you wanted to make the design inside or out. So here are few base steps to make this card. 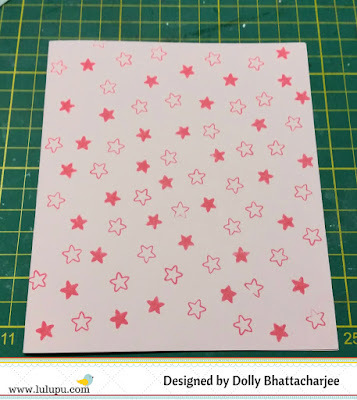 I have used small pattern rubber stamp, first stamp it with versamark ink and then apply clear embossing powder on it, you can tap back side of paper to remove excess powder. Then you need to melt embossing powder with heat gun, once it melts you can apply any Distress Ink (i have used pickled raspberry). Then here comes the fun part, take your mister and mix some perfect pearl powder in it and shake well to mix it properly, then spray on cardstock as many times you want (i sprayed it at least 10 times and when it still wet i took dry tissue paper and dab it some spots to remove ink). Now it times to wait till it dry. Please note at this time do not use your heat gun to dry ink fast as it may start melting your embossing powder. Steps 2.1: (optional, but i think you should try) when ink completely dry you can take your iron, put your cardstock in between of two blank A4 paper and just iron your card at least 2-3 times by changing upper A4 paper, it will start melting your powder, remove excessive ink and it will shine as we have used perfect pearl. Now take your 8 1/2 square paper. 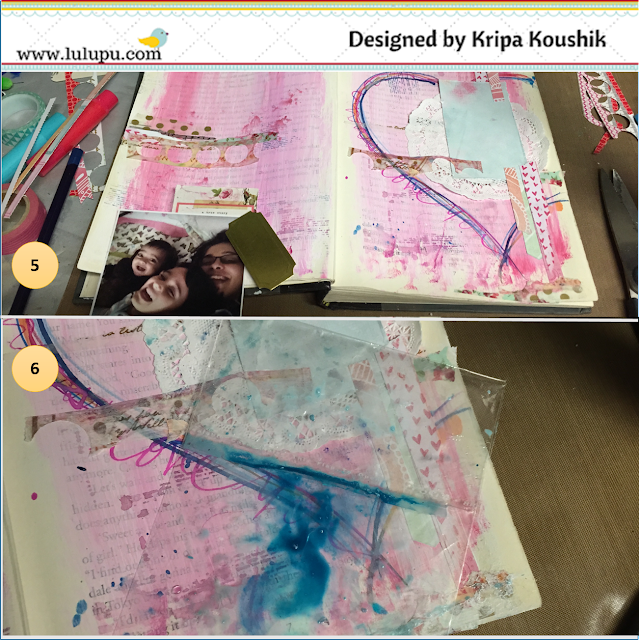 Design your card (i have design it as per this month challenge theme with watercolor and distress ink). Once you satisfied with your project, its time to convert it into explosion. Follow below image. Image says (1,2) fold your card diagonally so you will get X shape card. (3) flip your card, your card should facing back side up. 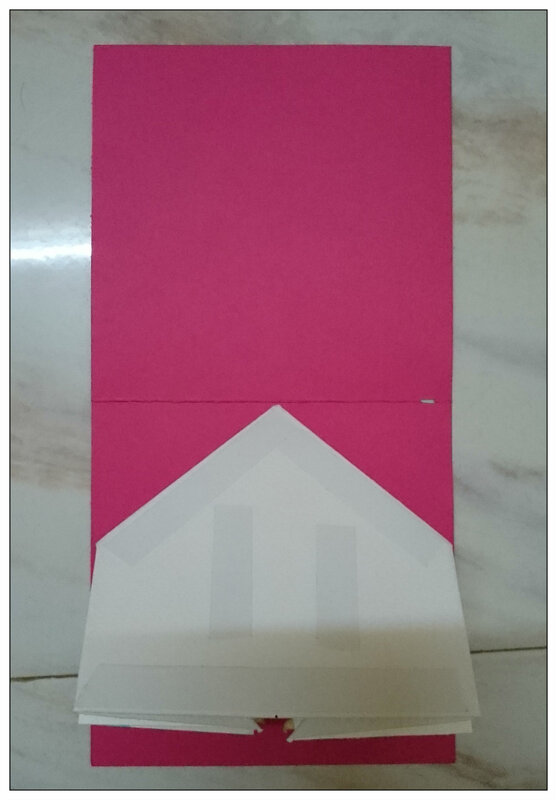 Now take your card and fold it like down to up side, so you will get X shape with horizontal line. 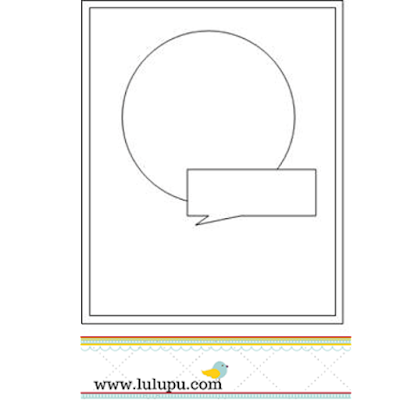 (4) open all flaps, now you have your card in a square shape with X and horizontal lines. (5) when you fold your card (design facing top side) you will see it will automatically fold and gives you upside down triangle 🔻. (6) you need to take ruler and mark at 4 1/4 both sides. (7) now pay attention, take your triangle right side corner and fold outside till you mark. Same you do it for left side also. (8) follow step 7. (9) now open all small triangles which u just folded and fold other side (i.e inside). And open it too. Now you are back with upside down triangle but with folded vertical lines. (10) now push all small triangles inside and secure it with bone folder. And here you go your explosion card fold is ready. You can see video for more clarification. Step 5: adhere it to your 10×5 inch flip top card. Adhere it from where your card folds like below image. And your explosion card is ready. You can add as much detail or keep it as casual as you like. I hope I’ve inspired you to give this a try, it makes a really fun card. Thank you so much Zalak for sharing so many techniques with us! Remember you still have time to enter the current challenge - BABY - A little bit of heaven. This month we have Ramya Anand guest designing for us. 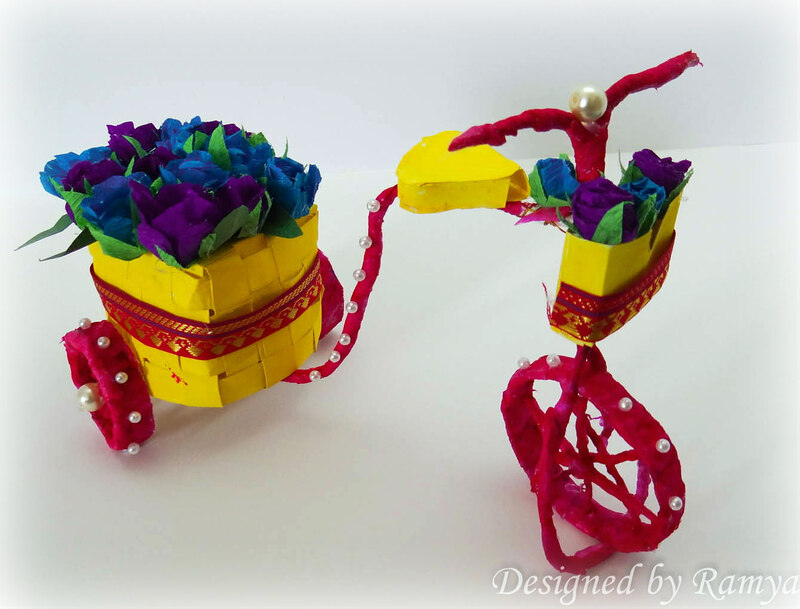 Ramya's creations are warm & cheerful & she has a knack of using bright colors with ease! Thank you for inviting me as the guest designer of this month!! This is very special to me as this is my first Guest designer post for any blog. I hail from Coimbatore ( Tamilnadu) and have completed M.tech in electrical and electronics engineering. After marriage I got settled in California (US). My mom also loves to make crafts and jewellery. Both my parents motivated me to do lots of crafts right from my childhood. Now am also lucky to get a husband who respects my work as much as I do and doesn't bother about the house becoming a mess due to crafting. I have been a creative person from my childhood. 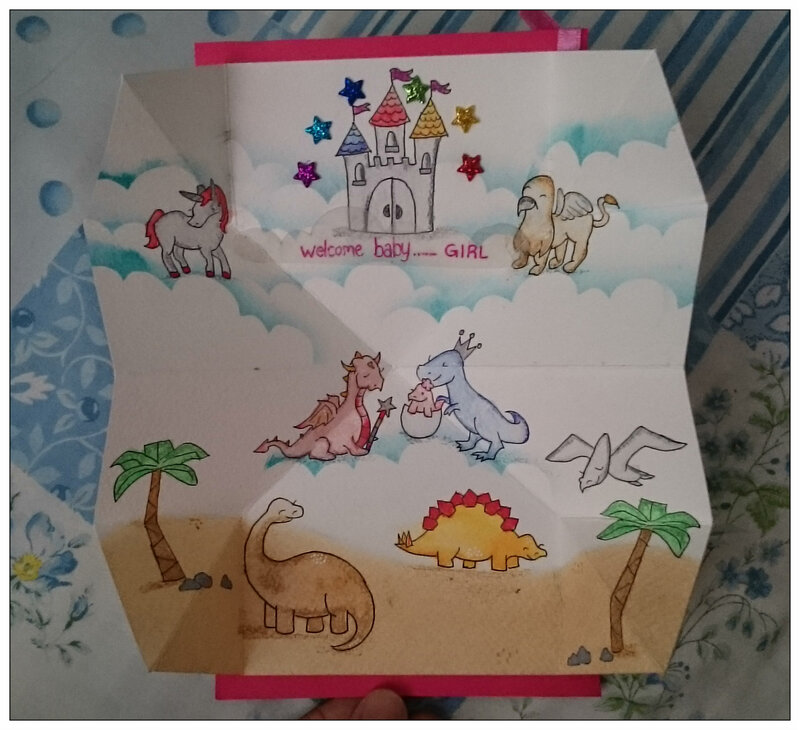 I used to get immense pleasure sending handmade cards to my relatives on special occasions. My mom and me used to make lots of decorations for Navarathri. The feedback and the appreciation that I got for my creations motivated me to keep my crafting alive. After marriage I got settled in US . To overcome my boredom I began to craft regularly. Seeing my interest my husband suggested me to start a blog. Not one I have three favorite techniques. 1. Jewelry making: I love to wear the jewelry designed by me matching my outfits. 2. Altered art: The joy of recycling an item and creating something new out of it. 3. Mixed media: ( My recent love).. .I love mixed media for the suspense and the freedom it gives. When I see a challenge theme I frame a basic idea in my mind and start researching about it. I love projects that involves a lot of challenges to me so I will zero down the most difficult project. In the process of making that project I learn a lot of things. Even if it didn't come as I wished I will get the satisfaction that I tried something new. Serious crafting began 2 years ago. Bright and bold colors with lots of flowers describe my signature style. 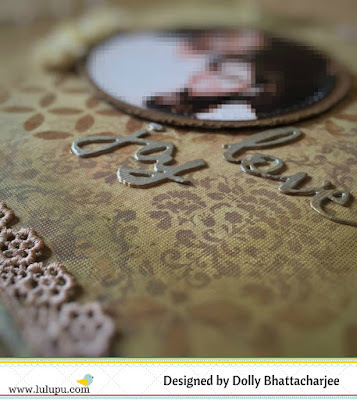 I love to add lots of embellishments and flowers to my craft. For jewelry making I would choose colors and designs from Indian sarees. For mixed media i will refer to Shilpa Nagaonkar , Jaya Raghuvanshi and Gabrielle Pollaco. I will also refer to the magazine called Paperhaus for layouts and canvas works. 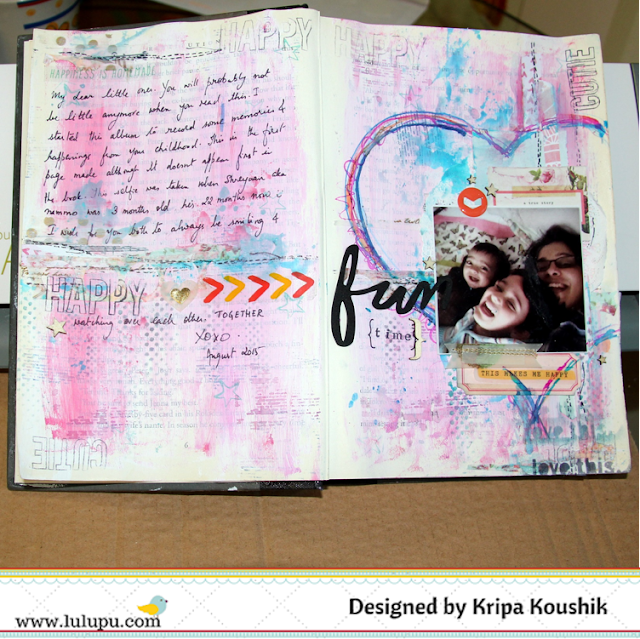 For writing an interesting post and lots of altered art ideas I refer to Rupa's blog. Recently I started following Marjie Kemper for her art journals and Catherine for card making techniques. Playing badminton with friends, Zumba dance classes, playing piano and reading magazines.On weekends I will go long hikes with my husband. Am currently learning different art journaling and mixed media techniques. Thank you Ramya & now lets head over to the cheerful inspirational tutorial she has for all of us. Step 1: Cut two circular pieces from tissue paper rolls and wrap it with tissue paper. Step 2: Twist two floral wires and cut them into small pieces such that it fits inside the circular piece. Wrap it with the tissue paper and glue it to the tyre. In a similar way make three tyres. Step 5: Glue the front portion of the bicycle to the front wheel. Join the front and back of the cycle using a thick wire. I made the basket by weaving 4 strips of paper. The flowers are hand cut as my punches doesn't support crepe papers. Since the bicycle is made of tissue paper use dry brush technique for paining it. I used fevicryl acrylic colors. 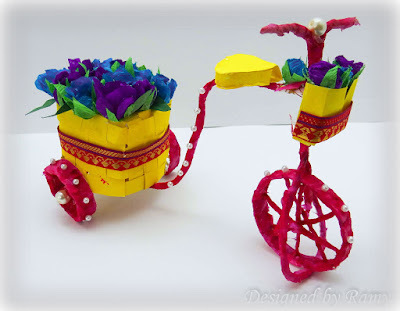 The bicycle cannot withstand weight so do not try to add more embellishments to it. If you want a more sturdy bicycle you can use empty tape rolls. But I felt tissue paper roll is easy to cut and hence I tried making with it. For stability you can tie floral wire at the joints as shown in the above picture. So a mini bicycle is ready to decorate your craft table!! Hope you all like my craft!! Wow Ramya this is absolutely adorable. Thank you so much for the tutorial! Hope you are all having a great month and enjoying the gorgeous baby themed creations that the DT have showcased and also the entries that have been linked. For the rest of the month, the DT will be playing with a sketch and sharing with you all our different interpretations of it. But don't forget, there is time till the end of the month to link projects for Baby - a little bit of heaven here. Today, I'm sharing with you a step by step on how this page was created in my altered book journal. Our very talented DT Tanvi Shah prepared this sketch. Are you able to see how I was inspired by it. The circle has been replaced with a heart and the speech bubble by the title. When interpreting a sketch, its alright to interchange the shapes and add a few extra elements, while still maintaining the basic look and feel of the sketch. A few days back, I bought an old book from the library and prepared it to use as a journal to record some very special memories. After all memory keeping is not just about photographs. This is the first page I made in this book. You can find many tutorials on the www on how to alter a book, but don't hold back your questions, will be very happy to answer them. Here is a step by step on how this page was prepared. I usually spend 3-8 hours on a layout, this one took about an hour, so a big tick for me to complete this album. 1. Start with a layer of gesso. If your gesso is too thick, spread it with an old credit card instead of a foam brush, don't use water as the pages are old and may crumple very easily. On the wet gesso, blend in two shades of pink, I've used fevicryl pearl paint. Now dry completely. 2. Open lindy sprays bottles ( product lost at the end of the post). 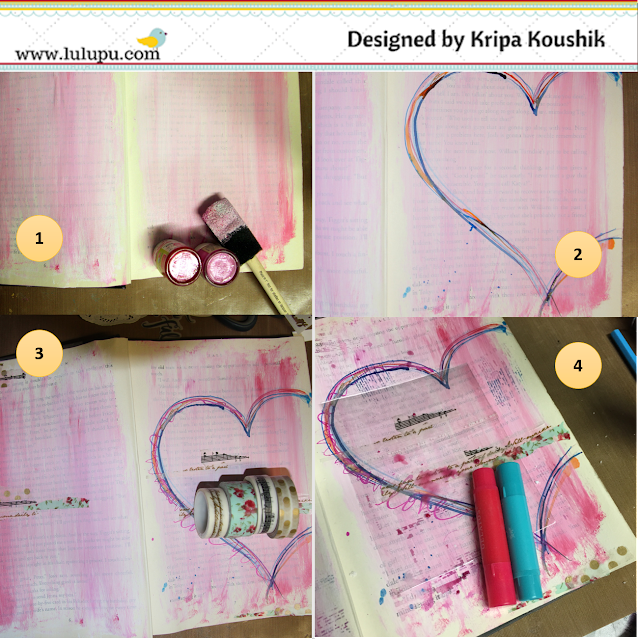 Using the tube tip, draw the outline of a heart. Need not be perfect, intersecting lines give more interest than a traced outline. 3. Some random stripes of washi tape. Tear it up so they are not all even width. 4. Time to add colour. First rub some gelato on a piece of plastic (packaging of a stamp). Add a tiny amount of water, splat the plastic paint side down on the background. Repeat the same with mists.I even stamped randomly on the page using the leftover paint instead of a stamp pad. 5, 6. Layer strips of pattern paper (Heidi Swapp Dreamy) and a doily. Add more colour using the same plastic piece. Do you see the strips with circles punched through? I stuck a few different washi tapes on a strip of scrap paper and punched circles through it. Time for embellishments. Layer some uber gorgeous pieces from Open Book ephemera pack, wood veneer, enamel dots, stickers and more stamping with archival ink. After sticking down the photograph redraw the part of the heart that got hidden behind the layers. Add journaling. All Done! Thank you for visiting us today, come back later this week to see another interpretation of this sketch. Babies are truly a little bit of heaven and they are such adorable gummy bunnies that one just gets lost in all the mischief and cute stuff they do!! I sure have awesome time with my tiny tot and I'm amazed at the way they sense and soak in all the teeny tiny details and activities that we do daily, not to mention, Imitate them straight away! Well, my baby is at the stage where she nods her head for a NO for every single thing I say to her !! Sigh...She listens and then does the exact opposite! But She's my happy place for sure, a smile on her face makes me happy to bits! 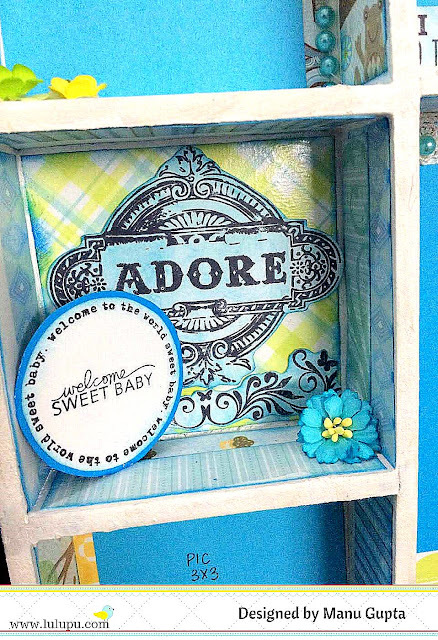 For this months challenge, I have made a Shadow box for a little baby boy!! 1. 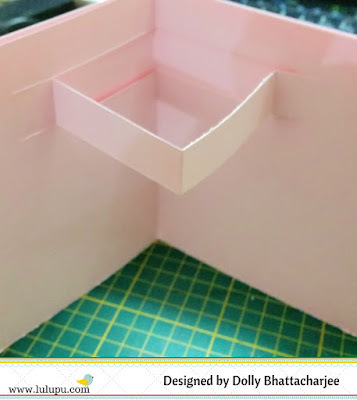 Take a shadow box of 12*12 size and any design, prime it with Gesso, I normally prime my MDF objects with primer and sand it a little before applying the base color. The advantage of applying gesso(primer) is that the base color coat comes up nicely and the exact same, than when the gesso is skipped. When the Gesso(primer) is skipped, the base coat color is always a little darker than the actual color and this might give the same exact color you want for your project. 2. 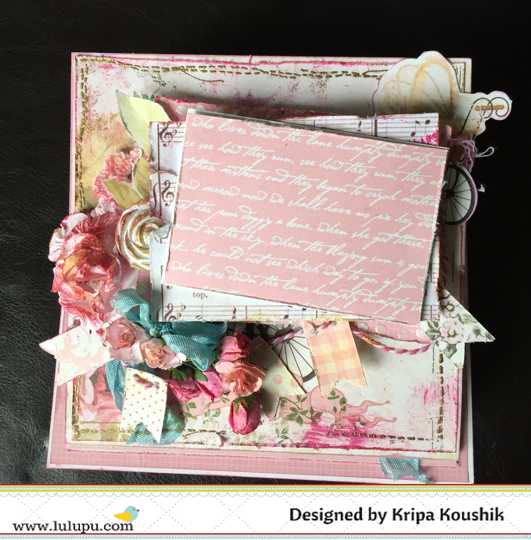 Once the shadow box is primed and coloured, cut out the pattern papers as per the dimensions of each internal box of the shadow box and apply using Mod Podge. 3. Embellish the boxes as per the way you want the box to have a final look and once the base pattern papers are applied, seal them up again with a coat of Mod Podge! There you go.. easy peasy!! Isn't it?? Here are a few more closer look at some of the elements ! Another place to put up the baby's picture!! We all sure love babies to the moon and back!! They are adorable little munchkins! I love shadow boxes for the basic fact that they can accommodate pictures as well as messages and is a great option for displaying ! 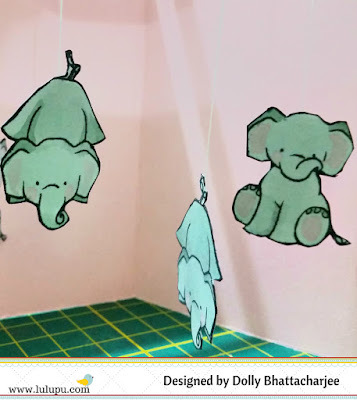 They make for one adorable wall pieces!! I hope you liked my pretty-all-blue shadow box and do remember to enter into this months challenge here. Do let me know if you liked this pretty one!! 1. 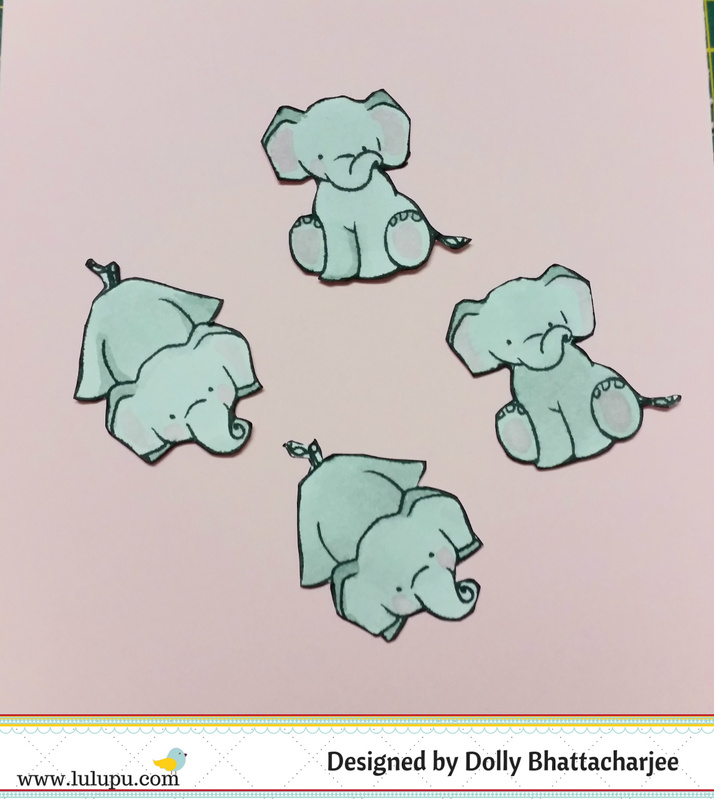 I used an cute baby elephant from Wplus9 - Unforgettable stamp set and coloured them and fussy cut each piece out. You can use any cute image for creating the mobile hanger. 2. For the card, I used a 5 1/2 X 10 card stock. I used two of them, since the inside piece (shown below) is used to create the hanger. 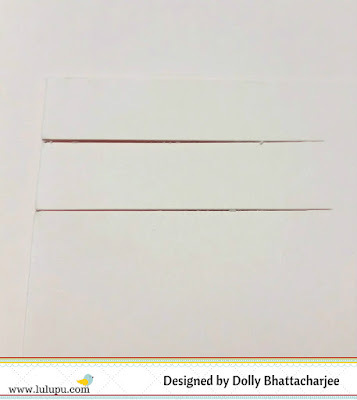 Fold the cardstock and make two parallel lines, approximately 5 cm long and cut along those lines. 4. 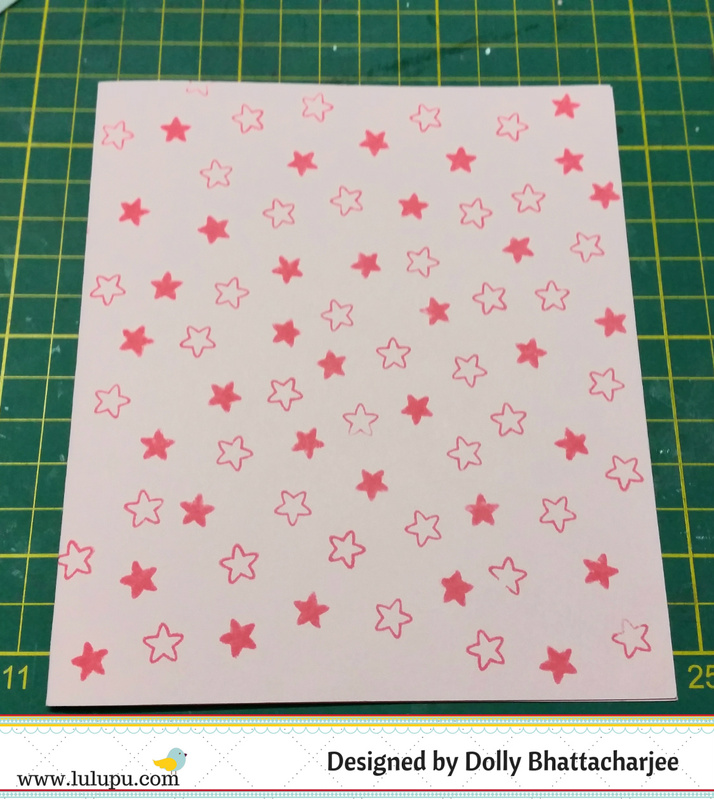 For the front of the card, I used the stars from the same stamp set and created a background using some distress ink in worn lipstick shade. I also added a ribbon on the front and added the sentiment welcome baby on a piece of cardstock which was fussy cut and mounted using some foam adhesive. 5. 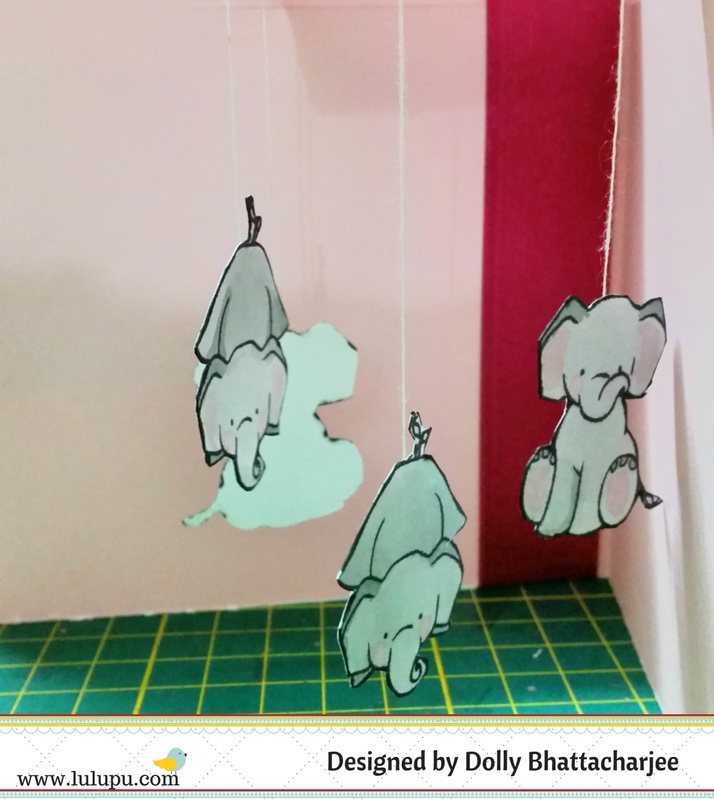 Finally, I strung the elephant images on the inside of the card, using some plain stitching thread. Be careful to hang the images at different lengths to add some interest. 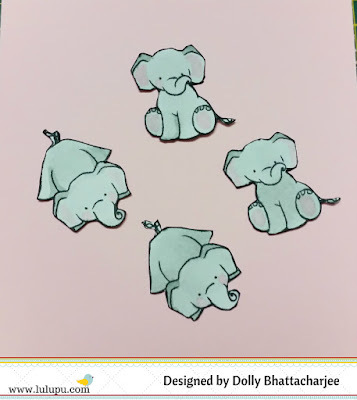 Once you open the card, you are greeted with these cute elephants turning on every side. 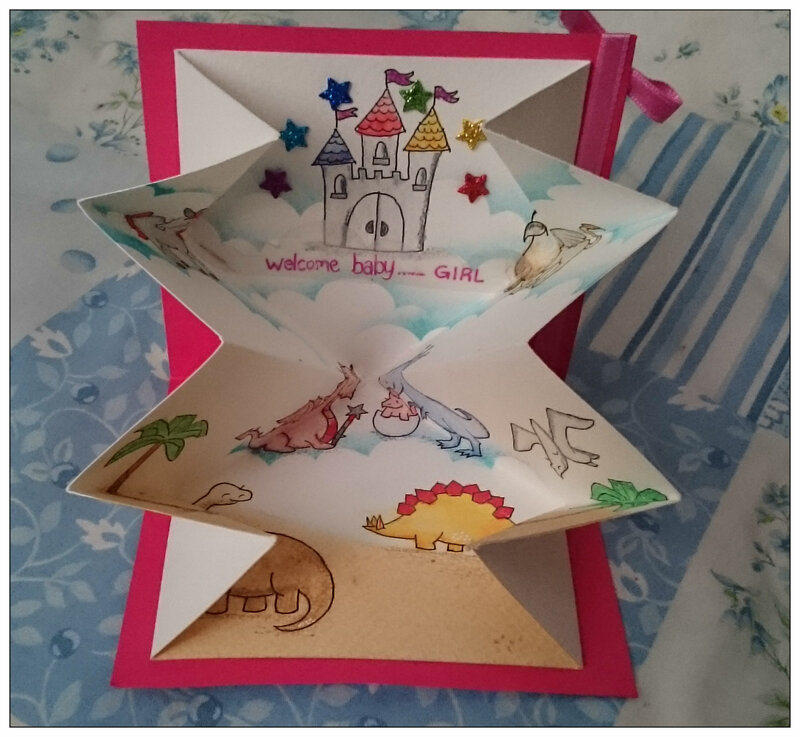 I think this would make a cute idea to create baby cards, since the options are endless. You can use stars, alphabets and any cute animal stamp you have in your stash. 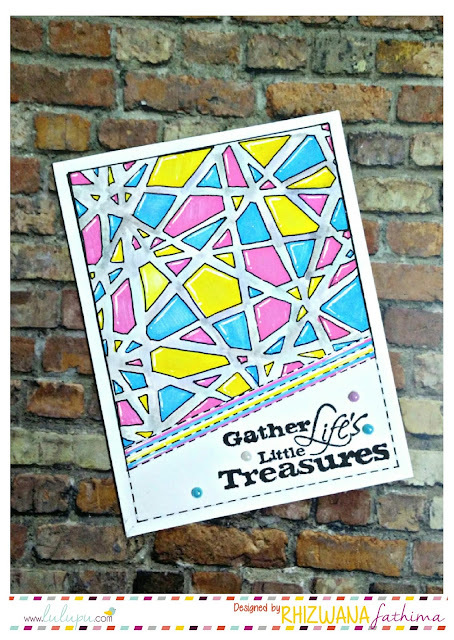 I hope you have been inspired by this project and do try something cute to link up for our monthly challenge! Till I meet you all next! Click here for the full post and our generic challenge guidelines can be found here. My paper crafting aspiration this year is to try new techniques and styles. 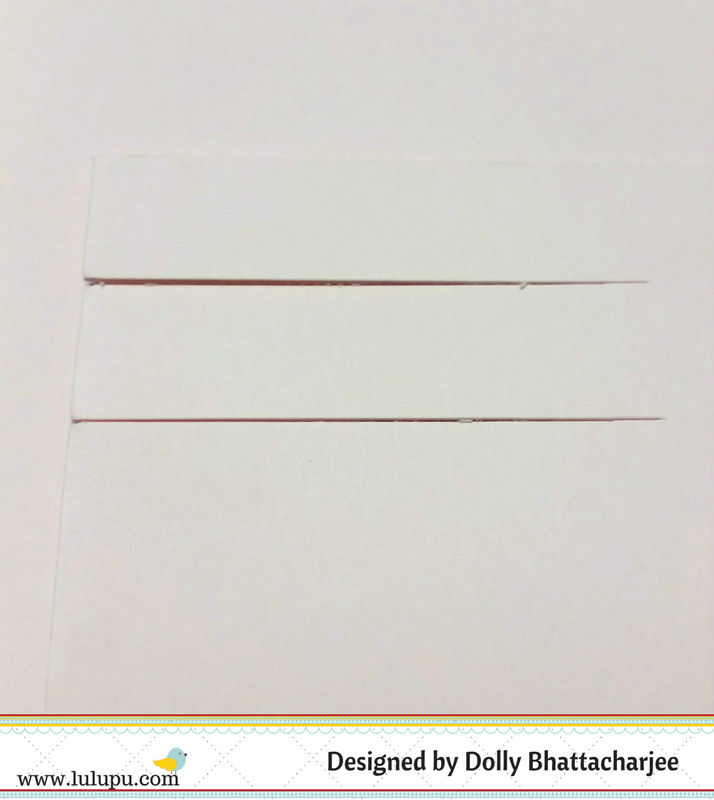 When I went through my box of projects, most were mixed media, so for this post, I've tried my hand at a traditional card which involves loads of measurements, both unfamiliar to me. This what my project looks like. The pink mat is a magnetic photo mat and can be fixed onto the base paper (music paper) both vertically and horizontally to accommodate any photo layout. This easel drawer photo display would make a perfect gift to new parents, or grandparents to show off adorable new baby wallet size photographs. 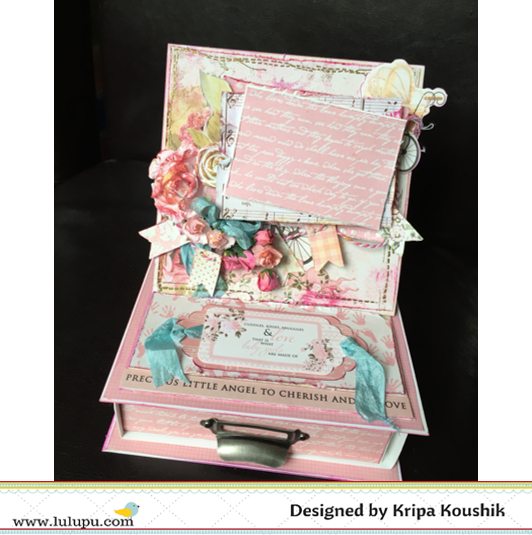 The drawer measures 6x6 and has room to accommodate loads of photographs and even a gift. This is the view from the top, with the display lying flat on the box. Because the box was made to a specific dimension, there was a lot of measuring required. 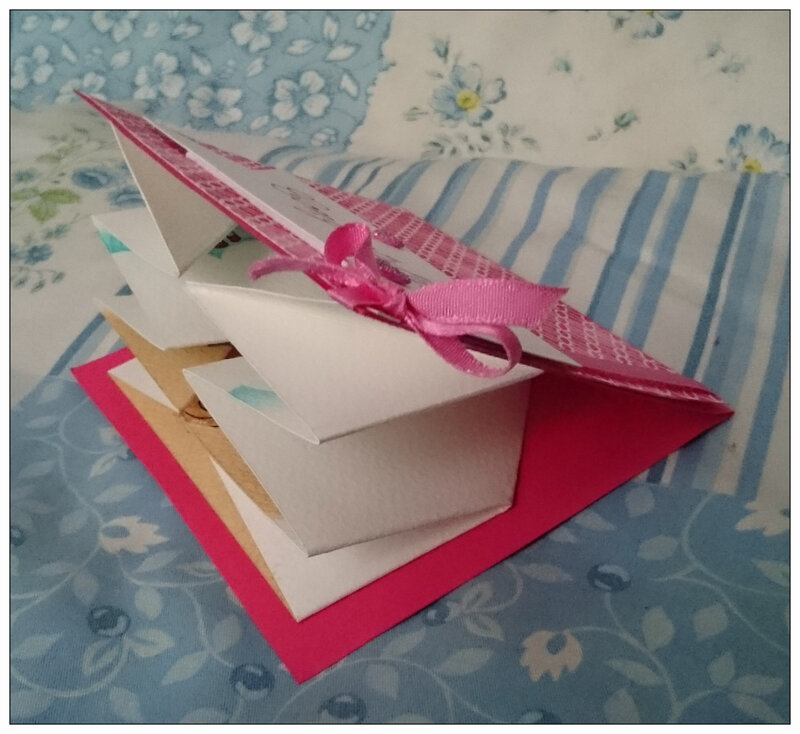 The drawer, and base of the card are white medium weight chipboard. The Tim Holtz ruler is perfect for precise measurement and Art Knife by WRMK made cutting chipboard easy. 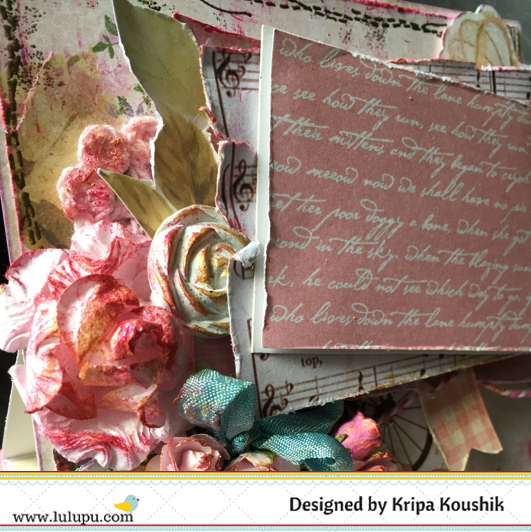 The pattern papers, die cuts, drawer pull and flowers are all Kaisercraft Pitter Patter collection. The banner was cut from left over scraps and the WRMK crop-a-dile punched tiny circular holes just enough to thread a twine. All the different layers have been popped up using foam tape. Apart from paper flowers, tucked in between the layers is a resin flower . 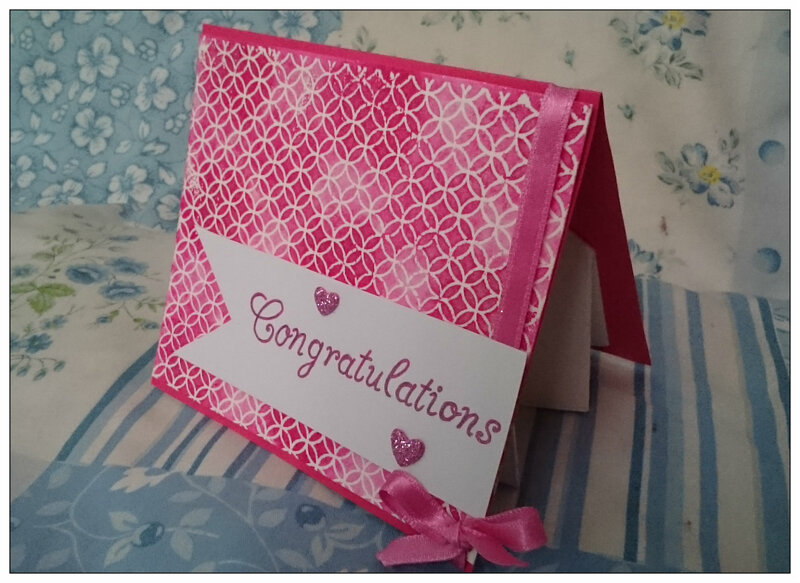 Ive also embossed a stitch stamp around the border of the card. That's it from me today. I hope you al feel encouraged to try something that not your usual style. 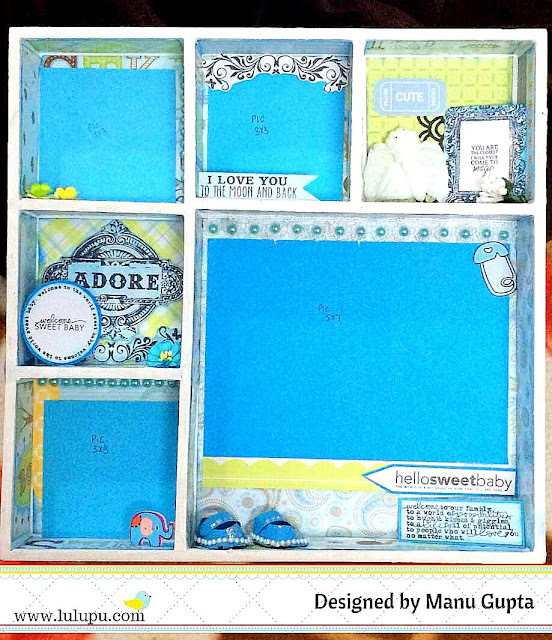 You can link your baby theme creations here.